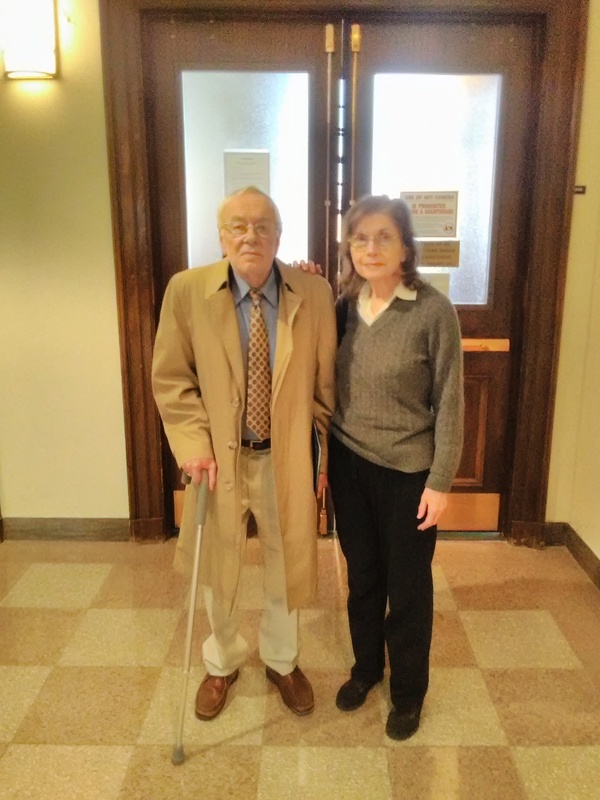 Stan and Ellen McDonald spent a morning last week in probate court, and the outcome, as usual, was frustration and disappointment for them. If any case illustrates the absolute necessity of maintaining guardianship over a person with developmental disabilities, this case is it. Stan and his wife, Ellen, are trying to overcome a devastating court ruling from a decade ago in which a judge concluded that their son, Andy, an intellectually disabled man, is so dangerous that he must be banned for life from ever returning to his hometown of Sherborn, where Stan and Ellen still live. We have pointed out that the 2006 ruling by former Probate Judge Edward Rockett contains factual misrepresentations about both Andy and Stan, and that the decision does not take into account changed circumstances in the case, including greatly improved behavior on Andy’s part. That ruling, however, was supported by Andy’s previous court-appointed guardian and by DDS; and Stan and Ellen have found that their opinion of the ruling doesn’t count for much. Stan and Ellen outside a probate courtroom where they encountered yet another round of frustration and disappointment last week. In 1986, Stan and his former wife agreed to the appointment of a guardian for Andy as part of the settlement of a longstanding custody battle over him. Since then, Stan has learned the hard way that once you agree to the appointment of a guardian from outside of the family, it can be difficult if not impossible to regain guardianship rights. And if you are not a legal guardian, you have little or no standing in probate court. Andy is now 48 and Stan is now 80; and Stan isn’t sure how much longer he and Ellen will be able to make the trip to visit Andy in his group home in Northborough. Lately, though, Stan and Ellen have found themselves repeatedly making an even more arduous trip — to the Middlesex Probate Court building in East Cambridge, where they have been fighting what has been a more than frustrating battle to convince the court that there would be virtually no risk in supervised home visits for Andy. But just getting up the two flights of outside and inside steps in the court building to where the elevator is located now presents a major challenge for Stan. To say the system is stacked against Stan and Ellen would be an understatement, particularly since, at this point in their lives, they can’t afford to hire an attorney to represent them. I accompanied them to a scheduled hearing last Thursday in the courthouse. The purpose of the hearing was to appoint a new permanent guardian for Andy — needless to say another guardian from outside the family. Stan and Ellen have never met the new guardian, who was appointed on a temporary basis last October. I can tell you that other than the clerk to the probate court judge in the case, no one at the court house appeared to be particularly helpful let alone nice to Stan or Ellen. The DDS attorney on the case, in fact, repeated a threat she first made last fall to seek contempt of court charges against Stan if he were to mention to the judge his desire for home visits from his son. It’s strange because it is apparently perfectly okay for Andy himself, or his court-appointed attorney, to say in court that Andy desires home visits. Why Stan could end up getting sent to jail for saying the same thing is beyond me. Last October, there seemed to be a ray of encouragement for the McDonalds. The probate judge at the time, Megan Christopher, seemed to be open to considering home visits for Andy. Andy did testify at that hearing and politely asked that he be granted a supervised visit home for a couple of hours. Christopher said she would take it under consideration. But shortly after the October hearing, Christopher was re-assigned to another courthouse, and all of her cases went to another judge, Randy J. Kaplan. It’s not that we have any reason to believe Judge Kaplan will be less sympathetic to the McDonalds, but it’s as if the whole ordeal of the October hearing never happened, and the McDonalds had to begin again with a new judge. Last week, when Stan and Ellen arrived at the probate court, Andy wasn’t there. Andy’s attorney told Stan that Andy had said he didn’t want to make the trip to the court that day. And then Andy’s attorney let Stan know that she was resigning from the case as of that day. So, as far as we know, no one in the McDonald family has legal representation in the case right now. When Stan and Ellen’s case was finally called at close to noon, there was a short conversation between the DDS attorney, Andy’s attorney, and Judge Kaplan at the bench. The court officer then announced that the hearing would be closed, and all non-parties had to leave. That included me, but it also included Ellen, who has no legal standing in the case. This was not the case with Judge Christopher, who had let Ellen, myself, and another advocate for the McDonalds remain in the hearing she presided over last fall. In last week’s hearing, Stan alone was allowed to stay, apparently because he is on record as having objected to the appointment of the new, non-family guardian for Andy. So, Stan was by himself in there, without legal representation and being threatened with contempt of court if he said the wrong thing as far as the DDS attorney was concerned. The hearing itself was over in minutes. It was essentially continued until June 2. At this point, we think the only hope for home visits for Andy lies in having an independent clinical evaluation done to determine whether he really is dangerous. Actually, we have been calling for this for two years. We don’t think Andy is dangerous and we don’t think anyone who knows or cares for him regularly believes he is. But whether to have an independent evaluation is a decision that can only be made by Andy’s new guardian. As usual, Stan and Ellen, the people most directly involved and affected, have no say in it. More than a year after an important family rights bill (H. 1459) for persons with developmental disabilities was sent to the Legislature’s Judiciary Committee, the committee co-chairs have decided it’s time to study the measure. Yes, we understand that as of yesterday, three days before the Thursday drop-dead date for bills that have not been voted on in committees in the current legislative session, Senator William Brownsberger and Representative John Fernandes ordered H. 1459 sent to yet another legislative study. Of course, we know what a study really means in Massachusetts Legislature-speak. It’s a euphemism for a legislative graveyard, or to use another metaphor, a legislative black hole from which nothing ever emerges. No study will ever be done on H. 1459. It will have to be refiled as a new bill next year if it is ever to see the light of day again. Since the bill is only technically still alive, but is in actuality dead, I think we can refer to it in the past tense. The bill proposed that a spouse or parent be presumed in probate court to be the proper person to be a guardian of a developmentally disabled or otherwise incapacitated person unless competent evidence is introduced to the contrary. We consider H. 1459 to have been a critically important rights measure for family members of people with disabilities — particularly developmental disabilities — who are routinely overruled in decisions about the care of their loved ones in probate court proceedings by medical and clinical “experts,” state agencies, probate court judges, and service providers. In many of those cases, developmentally disabled people are viewed as valuable funding sources, particularly by privatized group home providers who get billions of dollars in taxpayer money to provide those people with residential services. That is why the Department of Developmental Services, which is intent on further privatization of its services, is particularly eager to get attorneys and corporate providers appointed in probate court as guardians. Those non-family guardians are much more likely than are family members to cooperate with DDS’s privatization agenda. 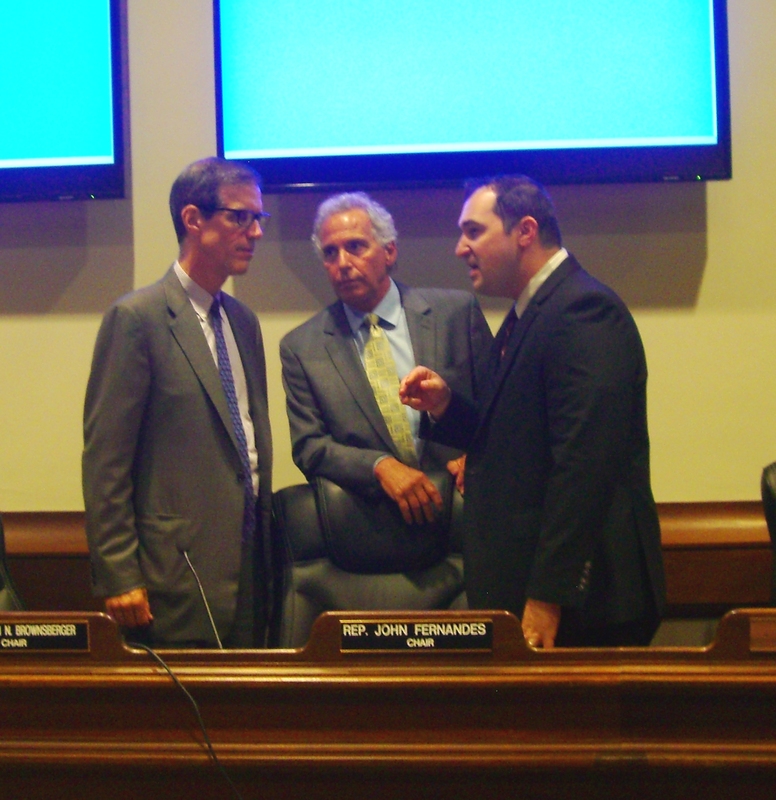 State Sen. William Brownsberger (left) and Rep. John Fernandes (center), co-chairs of the Judiciary Committee, confer with a legislative aide during a committee hearing in June 2015 on H. 1459 and related bills. It now appears they were probably discussing their legislative “black hole” strategy for many of those bills. If Brownsberger and Fernandes and other members of the Legislature really cared about the issues that H. 1459 is concerned with, they would have acted on the bill by now. In fact, they had 17 years to study it, including the entire year and two months that the bill sat in the Judiciary Committee in the current session with no action on it. This bill has been repeatedly filed since 1999, and we know it has been sent to similar “studies” in past legislative sessions. But apparently, no one has learned a thing about the bill in those past studies, and we’re sure that will be the case yet again. As we reported last month, this legislative session initially appeared to be different with regard to H. 1459. While COFAR has long supported the measure, it garnered the support last year for the first time of other major advocacy organizations for the developmentally disabled, including the Massachusetts Developmental Disabilities Council, which is technically part of the Baker administration. The MDDC listed H. 1459 as one of its legislative priorities for 2015-2016. The Judiciary Committee did hold a public hearing on H. 1459 last June. COFAR, the MDDC and other organizations submitted testimony in support of the measure. As far as we know, the bill was not controversial, and no one raised any opposition to it at the hearing. But the months dragged on and the Judiciary Committee did nothing about the bill. In January, State Sen. Richard Ross and Rep. David Linsky sent a letter to Brownsberger and Fernandes, urging them to finally pass the bill and saying it had their full support. Their letter noted that in light of continuing budget cuts to service coordinators in the DDS system, “family guardians are particularly crucial in managing their child’s transition and medical decisions.” But the letter apparently had no effect. Ross and Linsky are the local legislators of Stan McDonald, who has been fighting unsuccessfully against DDS for years to gain guardianship of his developmentally disabled son, Andy. It is Linsky who has repeatedly filed the guardianship bill since 1999 on behalf of McDonald and an unknown number of other people who are in similar positions. We may never find out the real reason that the guardianship bill can never get through the legislative process. But it’s my guess that DDS, for reasons discussed above, does not like the legislation. And experience has taught us that legislators on Beacon Hill rarely, if ever, challenge the authority of agencies like DDS or their lobbyists and corporate providers.